This was a last minute surprise in my inbox earlier this week, courtesy of Julie Czerneda. While I wasn't sure I would be able to read it cover-to-cover in time for today's launch, it ended up being one of those books where I just had to read one more story before going to bed. The A.I. 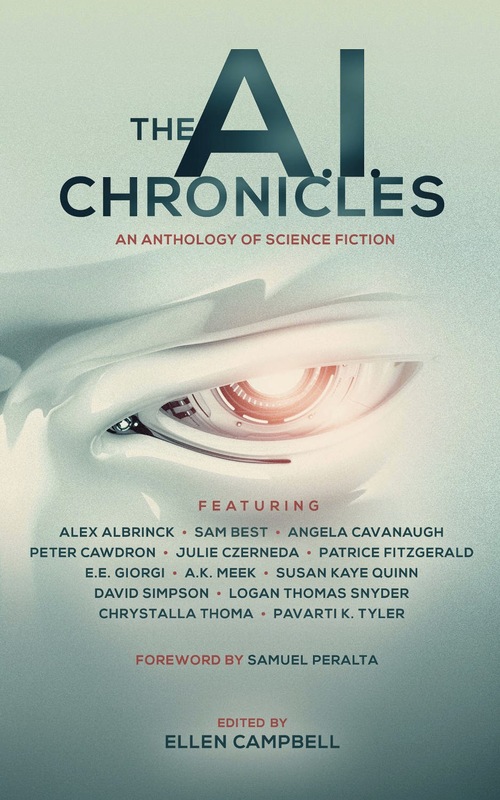 Chronicles is the latest collection in The Future Chronicles series, edited by Ellen Campbell, with a baker's dozen of authors on-hand to explore those moments where we come face-to-face with an intelligence we created but can no longer control. There's some dark stuff here, but there's also some very funny stuff, and it all has a cautionary sort of feel. The Syntax of Consciousness by Pavarti K. Tyler and Piece of Cake by Patrice Fitzgerald were fun stories of what happens when life's conveniences are perfected - just remember to be careful what you wish for. Vendetta by Chrystalla Thoma was the creepiest of the lot, with a young woman technologically augmented to better fit in, but perhaps a little too much for her (or society's) own good. Taking a very different approach to a similar theme, Darkly Cries the Digital by A.K. Meek was a definite favorite, a story of science and superstition that asks how far a parent would go to save a child . . . and just what the cost might be. There were, of course, a few stories that I chose to skip over after reading the story synopses, but it's a rare collection where everything works for every reader. The 'hard' side of science fiction has never intrigued me as much as the human side, but The A.I. Chronicles offers a nice balance that's as thoughtful as it is entertaining. Not surprised you really liked the story by EE Giorgi. This is her lucky Friday the 13th! Will download that book today.